Robert Cathles: Word 2010 Error: "Problem with the contents of the file"
Update 1: There is a solution that may work for some people from Microsoft (released 18/02/2013, nearly a year after this post). Download the Fix-it from this page and see if it repairs the file for you. There is a bug in Word 2010 I've come across for the third time now to do with XML validation on documents when they are saved over a network. The file 113 Honey Lane brochure.docx cannot be opened because there are problems with the contents. 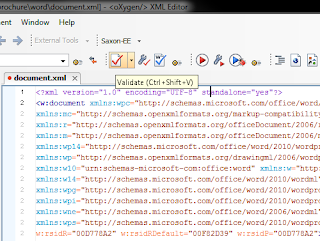 The XML data is invalid according to the schema. Some online articles report this as a problem with the table of contents, however I've worked with documents that don't have a table of contents. Also I cannot see any Microsoft response to this issue and I hope to get their attention to get this fixed. Word does have an 'Open & Repair' option, however this only tries to read text from the document, so this doesn't help us at all and leaves us stranded with a 99.99% valid XML document but unable to use it - that is one of the pitfalls of XML I guess. But really this is a bug that Microsoft needs to correct. 1. 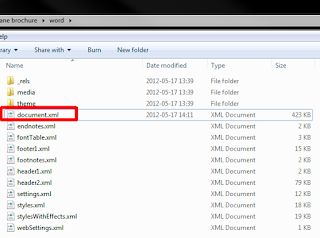 Extract the DOCX file using an compression program (i.e. 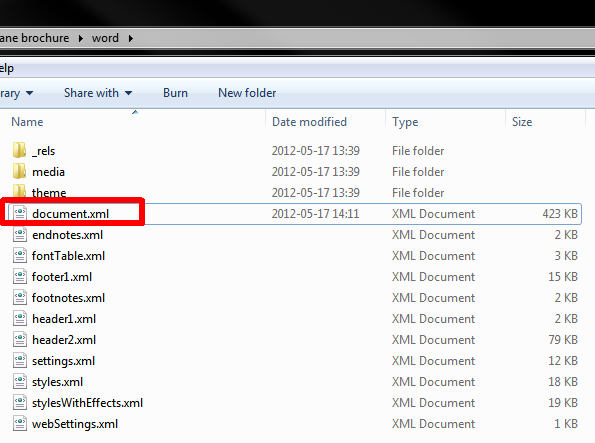 7-zip) to a new folder. 3. 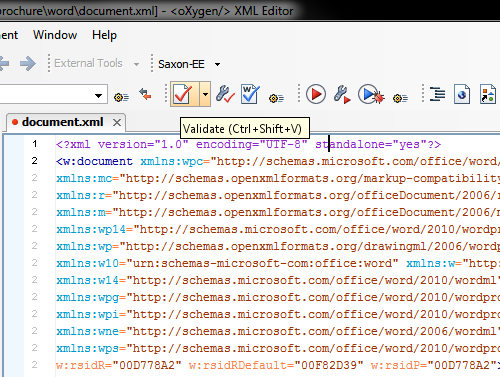 Open up Oxygen and open the word/document.xml file from the extracted folder. 5. Right at the bottom of the validation report are the important errors. Some errors are permittable. The ones in red are the ones we need to fix. The ones in green are fine. 6. Fix the XML. CTRL+L can take you to the location in blue (Line 2, Column 365...) Here is one example of XML that needs to be fixed but in general the problems I've seen have involved incomplete tags and missing closing tags. Here, the < mc:Fallback > tag doesn't have a closing tag. Also, there is no closing < /mc:AlternateContent > tag before the new < w:p >. Here is the corrected version. The first 4 validation errors from above, I actually couldn't fix, so I just removed the < mc:Fallback > block altogether (it is a fallback so it is not important anyway). After saving and validating again we can see there are 2 more errors somewhere else in the document, again these just need some more closing tags. 7. When it validates so there are no more major errors (not to do with namespaces/context), just zip up all the files again in the extracted folder (must be using the ZIP format, other parameters don't matter) and rename to docx. Now open it in Word and the error is gone.